CBT is based on the 'cognitive model of emotional disorders' which focuses on the way thoughts influence how people feel and how they behave – the relationship between these is shown in the diagram. The central principle of the cognitive model is that the way people think exerts a powerful influence on the way they feel. In other words, it is not events in themselves that matter, but the meaning of those events to the individual. The 'same' event can have different emotional consequences for different people depending on their individual interpretation of that event. By altering the interpretation of the event , we can help people to overcome their distress and to cope with problems more easily. When a person experiences emotional distress, their thinking becomes rigid and distorted and normal information-processing becomes faulty due to a persistent negative bias in thinking. This negative bias means that the person ignores or discounts positive information and it becomes hard to see things in perspective which leads to further emotional distress. 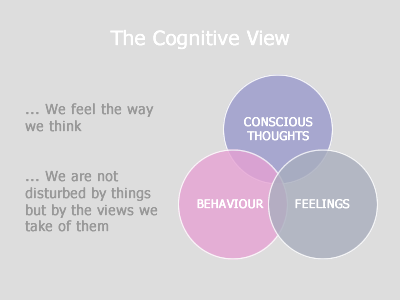 The person feels and behaves as if the thoughts and beliefs which they have are facts, however because of the negative bias, this may not be so which is why techniques used in CBT include challenging these thoughts, beliefs and assumptions and weighing up the evidence for and against the person's view of their situation with a view to identifying alternative, more helpful perspectives. What Problems Can CBT Help With? CBT is one of the most effective treatments for conditions where anxiety or depression is the main problem and it is as effective as antidepressants for many types of depression, particularly mild and moderate depression. The National Institute for Health and Clinical Excellence (NICE) recommends CBT as the treatment of choice for a number of mental health difficulties, including depression, post-traumatic stress disorder, OCD, and bulimia (see Further Reading). CBT is usually a short-term therapy, however, the number of sessions required does depend on the severity of problems you are experiencing and how long this has been going on for. Most people seem to need at least six sessions with each session either being weekly or fortnightly. The average is between 12-20 but every person is different and the schedule will be tailored to your individual needs and wishes. I offer a free-of-charge initial assessment by telephone which helps me to assess how easily I can help you and also of course, helps you to decide if my approach to CBT is suitable for you.